As the technology of building systems becomes ever more complex, the need for documentation and training increases. Berghammer Construction supports seamless transitions to new systems with a proactive commissioning process that provides our clients with useful tools they can use long after they take occupancy of their facility. We begin by collecting and reviewing all the operations and maintenance manuals and “as-built” drawings, providing them in both hard copy and electronic formats prior to training. Training sessions are videotaped, so new employees can be quickly educated. As you gain greater understanding of the systems during day-to-day operations, Berghammer remains on your side with four post-construction visits to ensure all systems are performing to your expectations. We recommend these visits during the second, fifth, seventh and 11th month of occupancy. 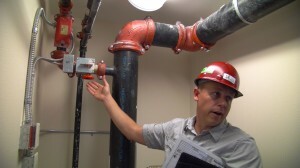 Most post-construction facility issues center around the HVAC system as it adjusts to changes in the seasons. The systems operate well in the middle of each season, but may need fine-tuning to operate exactly as anticipated during the one- or two-week period between seasons. Even the most complex systems occassionally require fine-tuning to allow them to operate optimally and provide the highest levels of comfort all year round. Seasonal changes in temperature and humidity also can effect interior finishes.